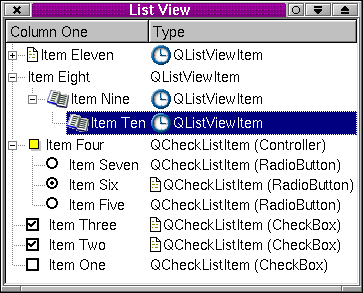 The QCheckListItem class provides checkable list view items. QCheckListItems are used in QListViews to provide QListViewItems that are checkboxes, radio buttons or controllers. Checkbox and controller check list items may be inserted at any level in a list view. Radio button check list items must be children of a controller check list item. The item can be checked or unchecked with setOn(). Its type can be retrieved with type() and its text retrieved with text(). See also QListViewItem, QListView, and Advanced Widgets. This enum specifies a QCheckListItem's toggle state. Constructs a checkable item with parent parent, text text and of type tt. Note that a RadioButton must be the child of a RadioButtonController, otherwise it will not toggle. Constructs a checkable item with parent parent, which is after after in the parent's list of children, and with text text and of type tt. Note that a RadioButton must be the child of a RadioButtonController, otherwise it will not toggle. Constructs a checkable item with parent parent, text text and of type tt. Note that this item must not be a RadioButton. Radio buttons must be children of a RadioButtonController. Constructs a checkable item with parent parent, which is after after in the parent's list of children, with text text and of type tt. Note that this item must not be a RadioButton. Radio buttons must be children of a RadioButtonController. Constructs a checkable item with parent parent, text text and of type tt. Note that tt must not be RadioButton. Radio buttons must be children of a RadioButtonController. Constructs a checkable item with parent parent, which is after after in the parent's list of children, with text text and of type tt. Note that tt must not be RadioButton. Radio buttons must be children of a RadioButtonController. Constructs a RadioButtonController item with parent parent, text text and pixmap p.
Destroys the item, and all its children to any depth, freeing up all allocated resources. Toggle check box or set radio button to on. Returns TRUE if the item is toggled on; otherwise returns FALSE. Returns TRUE if the item is tristate; otherwise returns FALSE. Draws the focus rectangle r using the color group cg on the painter p.
Make your derived classes return their own values for rtti(), and you can distinguish between list view items. You should use values greater than 1000, to allow for extensions to this class. Sets the button on if b is TRUE, otherwise sets it off. Maintains radio button exclusivity. Sets the toggle state of the checklistitem to s. s can be Off, NoChange or On. Tristate can only be enabled for CheckBox or CheckBoxController, therefore the NoChange only applies to them. Setting the state to On or Off on a CheckBoxController will recursivly set the states of its children to the same state. Setting the state to NoChange on a CheckBoxController will make it recursivly recall the previous stored state of its children. If there was no previous stored state the children are all set to On. Sets tristate to b if the Type is either a CheckBoxController or a CheckBox. CheckBoxControllers are tristate by default. See also state() and isTristate(). Returns the state of the item. This virtual function is called when the item changes its state. NoChange (if tristate is enabled and the type is either CheckBox or CheckBoxController) reports the same as Off, so use state() to determine if the state is actually Off or NoChange. If this is a RadioButtonController that has RadioButton children, turn off the child that is on. Returns the type of this item.